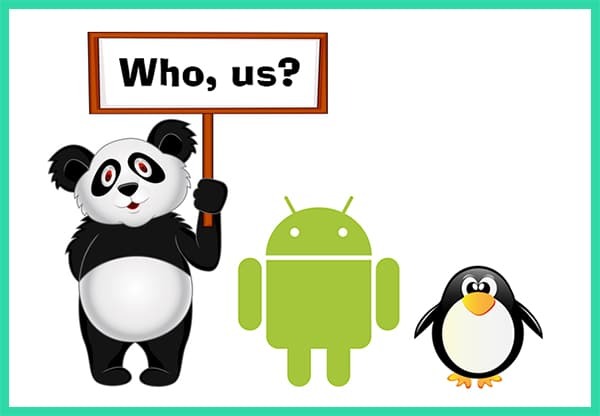 The Hazards of Digital Marketing: Pandas, Penguins, and Androids…Oh My! I’d love to tell you that today’s title is in jest…but it’s not. The digital marketing landscape is in fact quite dangerous. Avoiding the topic and remaining ignorant are not a viable option either; this attitude carries a whole different set of consequences for your business. Today I want to address those of you who are being pro-active for yourself or who have outsourced your digital marketing to a “professional”. I want to proceed with the assumption that you already understand that things like inbound links to your website, relevant content, and being prepared for the mobile web are supremely important things that need to be addressed. I don’t presume that you know all there is to know; it’s enough for today that you simply understand that all of these things matter. It goes without saying that any business with a website wants their site to be found by as many people as possible. As we all become savvier and technology pushes the envelope, we’ve learned that there are certain things that we can do to be viewed favorably by the search engines. I think it’s also safe to say that we all know that everything is also in a constant state of flux online. The search engines are constantly trying to improve the search results that they deliver. They know that when we search for information and they serve up something totally irrelevant that we are likely to use a different search engine. Search engines make all of their revenue by keeping their users happy and loyal. They really can’t afford for you not to be happy with the results they dish up…this is BIG business! Search engines scour the whole of the Internet all day everyday so that they can know and categorize every piece of information available. The “robots” that “crawl” our websites are driven by complex algorithms that take into account many, many things. Exponentially speaking, and because things like signals from social networks, semantics, and real-time search are taken into account, these algorithm programs are becoming more and more like artificial intelligence as opposed to a mindless and mathematically driven tool. Let me just say (as a person who has been dealing with this for a long time) that once upon a time the search engines could actually be fooled or “gamed” into delivering favorable results for anyone who learned the system. I’d go as far as to say that learning to manipulate the system gave birth to what we now call search engine optimization (SEO). I’ve said all of this so far to premise my title statement that digital marketing can be hazardous. The harm can come in many forms, but what I’m saying is that old-school thinking and practices based on outdated understanding can damage your website’s standing as judged by the search engines. If the algorithm doesn’t like what it finds out about your site it will NOT be a friend to you. What’s worse is that if it finds you out of compliance with today’s standards your site may actually be penalized (think: rendered invisible). This is why the cutesy animal names in the title. These are actually real names given to search engine algorithm updates that are anything but cute in the way they handle their tasks and deliver judgment. Before I launch into what these algorithm updates actually do, I want to establish my perspective and expertise. Here at TrustWorkz® we assess all of our client’s websites before we rebuild them and begin to manage them. What we see on a wholesale scale is the damage left over from a business owners own efforts or those of a company that was hired to handle things. What we see are the remnants of either a poor understanding of how things work or what we call “black hat SEO”. In either instance, the affect is the same and it’s not good. We are then forced to try and reverse this damage before we employ a more correct and effective approach. In some instances we simply can’t erase all that has been done. It then becomes a matter of how much good we can heap on top of all the irreversible bad. This is not optimal and we truly hate to see this scenario because it’s time consuming and expensive. Older websites where there have been “too many cooks in the kitchen” are oftentimes in the worst shape of all. For the record, I’m not picking on Google. Their updates just have the cutest names and more information has been documented about their updates because, well, they’re Google. All of the other search engines employ similar tactics and methodology. Google’s Panda update (< you’re clicking through on all of these links, right?) deals with the actual content on a website. In the beginning we all pretty much had similar informational websites. They were merely a “brochure” for the Internet that explained our products and services to the world. These were typically 5-7 pages and included information about our company, our history, and our products/services. Our only visitors were the ones we actually drove there by telling people where our www address were located. We put it on signs, doors, t-shirts, and business cards. After a short time it became possible for us to actually be found organically when people searched the Internet. Some sites performed better than others, and then the game was on! SEO companies were born and website builders got a clue. Having better content than the other guy became a factor. We were forced to create and post content that was both pleasing and valuable for our readers. We also had to create this same content to catch the attention of the search engines. With the adoption of blogging as a best practice, content became king. Now we all scurry to try and produce (or outsource) as much great content as is humanly possible. The problem became that this was very time consuming or expensive. People (and digital marketing companies) began to look for shortcuts. It became the norm to curate and/or buy content to put on our sites. Companies that sold content did so at scale and it became easiest to create industry specific content and to push the same content to multiple client’s websites at the same time. Everybody got the same stuff. Google (and people) got wise to this pretty quickly and the Panda update taught the algorithm to identify all of this cheap “duplicate” content. In short, if you borrowed or bought content (from a “content farm”), Panda hates you. Now you’ll need to write original content that is more focused on the reader and delivering value. Apparently pandas are both cute AND smart. The Penguin update was devised to deal with all of those wonderful inbound links we built from other websites to our own. What we see most often from pro-active website owners are horrible inbound links from every silly directory that they could find. Every local directory, cousin’s website, or free business directory…and the like. The thinking was that more was always better. We see sites with hundreds or even thousands of these links. The other available option was to pay one of those companies that claimed that they guaranteed that they could get you on page 1 of Google. These companies either built or bought into huge automated “link farms” that served no other purpose than to achieve a high page rank and to then provide a link back to your website for a price. Heads up: Google sees everything and they know all about this practice. Today, you’ll need to have solid inbound links from relevant sites using relevant keywords that link to a relevant page with relevant and valuable content on it. No more robotic or automated tricks, you’re going to have to drive all of this with a real live human. I mentioned Android too. Again, I’m not picking on Google. I just picked Android to represent mobile devices…you know, phones and tablets. I know that “mobile” is on everyone’s mind lately, and it should be. We have to consider the behavior of the world and the shift toward mobile as the preferred method for finding and sharing information. Google is also aware of this shift and are striving to not only keep up with the trend but to dominate it. Google has stated that they will adjust their algorithm to account for all of this searching from our mobile devices. Is your website mobile responsive? When you look at your site on an iPhone for instance, is the user-experience a good one, do you have to pinch and zoom and scroll all over just to navigate around? Thinking about all of this now and moving to get your website up to par on mobile devices is probably one of the most important decisions you should be considering. These are just a few of the factors and considerations that I felt you should be aware of today. There are many others of course, and I want you to come back often to learn as much as you can…after all, it’s why we blog in the first place. I actually hope that this information has made you a little nervous about your own website. If so, you can learn more about your web presence by letting one of our professionals analyze your website. When we receive your request we will perform an in-depth analysis of your entire web presence and we will call you to candidly discuss what we find. It’s not a sales pitch and we won’t even mention our services unless you express an interest. We are quite simply a very empathetic and altruistic company at our core. It really is our pleasure to provide you with this honest insight. I look forward to hearing from you soon!